Providing high health, salmonella-negative flocks and ensuring clean and pathogen-free facilities are our top priority. 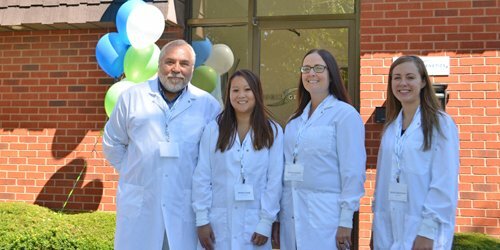 For this reason, we are proud to highlight the recent expansion of our North American Poultry Laboratory, based in Kitchener, Ontario, Canada. This central facility, run by a small but efficient team of six, processes approximately 200,000 samples per year from all turkey and layer parent stock flocks in North America. They also schedule and prepare all tests required by regulatory and export agencies. With world class biosecurity as a key component of the new layout, it was the lab staff that came up with the design of the various zones. The design sought to ensure secure division between zones for preparing test kits as well as receiving, handling and analyzing different sample types. Lab Manager, Peter Pozder, with over twenty-five years of experience at Hendrix Genetics, said “The design of this lab was truly a collaborative effort. The team worked together to identify opportunities for improvement within the current layout and planned the enhanced work flow; all without any interruption to the testing schedule.” After inspection for biosecurity standards, the new design was approved and is licensed under Canadian federal public health and food inspection agencies. We are proud to showcase this investment in continuous improvement and advancing best practices in the industry for the benefit of food safety and biosecurity.